Placer riches in Alder Gulch spawned many colorful communities. 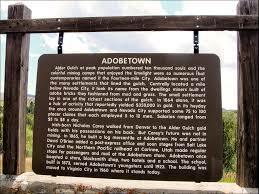 Among them, Adobetown flourished briefly as the center of mining activity in 1864. In that year alone, miners extracted over $350,000 in gold from nearby streams. Taking its name from the numerous adobe shacks the miners constructed in the vicinity Adobetown assumed permanence in the fall of 1865 when Nicholas Carey and David O’Brien erected a large log store. The building’s central location contributed to the growth of the settlement and the development of other businesses. Stages from Salt Lake City and later the Union Pacific Railroad at Corinne, Utah, made regular stops at the Adobetown store for passengers and mail. The town received an official post office in 1875 with Carey as postmaster. He, and later his wife Mary, served as the community’s only postmasters until her retirement and the subsequent close of the office in the fall of 1907. Once in lively rivalry with Virginia City for the social and political leadership of Alder Gulch, Adobetown’s population and importance waned after 1865 as the placer gold gave out in the immediate area.